History: Established in the mid-1930s. Improvements: Two lane paved, with gravel section on about half the route through the national forest.. Comments: My Benchmark Atlas showed this route turned back to the National Forest Service inside the national forest, but the 2003 state highway map and the current milepost map show it in its original entirety. History: Established late 1930s. By the 1940s was part of NM-32, and is now part of NM-601. History: May be a relatively recent route (mid 1980s). A post-1988 route would have a 4xx designation. Not shown on any oil company maps. History: Established late 1950s. Incorporated NM-256 E of Jal, which had been established early 1950s. Highway Engineering 101: don't route a roadway through a swale if you can avoid it. 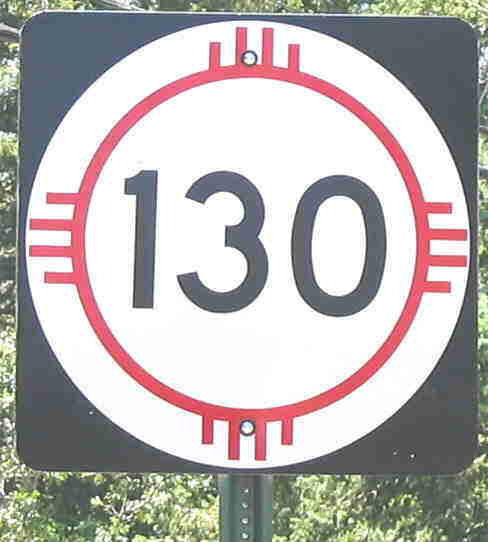 Just east of NM-31, NM-128 runs along the north side of Salt Lake. Work is underway (as of the time the photo was taken) to relocate the road to higher ground to the north. History: Established in the 1930s, originally beginning at NM-67. When that route was truncated in the mid-1930s, NM-129 assumed the former route of NM-67 south to U.S. 66. On the north, the route ran to Conchas Dam, and even after NM-104 was extended to Tucumcari, these routes had a concurrent section south of the dam. NM-129 was truncated at the south junction with NM-104 in 1988. History: Established mid 1950s from NM-24 to NM-83 (now U.S. 82). Assumed the former route of NM-24 west to Cloudcroft in 1988. History: From its number, must have been established before 1988 (otherwise it would be a 3xx route). However, it does not show on any maps prior to the 2003 New Mexico official highway map, including the 1999 Benchmark Atlas. History: Established mid-1930s. Assumed the easternmost part of NM-83 in 1988, east to the Texas border. Comments: The number change at the east end of NM-83 is a bit illogical, even though 83 is a side road at this junction (the road bends 90° east a couple of miles north of the junction). Despite this jog to the north, 83 used to form a continuous route from Lovington to Denver City, TX. History: Established mid-1930s, probably the same time as 132. Extended west and north to NM-83 in the 1940s. This latter segment was removed from the state highway system by 1988. History: In the late 1930s, U.S. 85 north of Las Cruces was moved onto a more westerly alignment, and old U.S. 85 was given this designation. By the early 1940s, this was renumbered as an extension of NM-28. It is now a county road. Improvements: Existing portion of the state route is paved. History: Established early 1950s. Removed from state highway system by late 1960s. Comments: Ran along Bridge Blvd. from just west of the Barelas Bridge, where U.S. 85 turned south onto Isleta Blvd., to Central Avenue. Although late 1960s and early 1970s maps show this route as removed, I remember references to it from when I lived in Albuquerque in the mid-1970s. Whether on maps or actual posted signs I don't remember. History: Established early-mid 1930s as a replacement for the original route (NM-106) connecting New Mexico and Colorado northwest of Chama, prior to extension of U.S. 84. This road became U.S. 84 in the early 1940s. This sign with the faded zia taken just west of the Texas-New Mexico state line west of I-10. East of here it is TX-178. History: Constructed in the 1990s as a connection to a new Port of Entry on the Mexican border at Santa Theresa. Comments: The NHS map also shows a designated future route from this road, where it bends from north to east, to intersect I-10 north of Anthony. Also named Pete V. Domenici International Highway for the Senator. It currently connects with Artcraft Road (TX-178), which intersects I-10 north of El Paso. History: Established late 1940s. May have originally terminated at one of the road forks as the road heads west and south in to the mountains, but since maps are ambiguous it is possible it was always a state highway as far as El Paso Gap. It was extended south to the Texas border, probably 1990s. History: Probably established late 1990s or early 2000s. Comments: Follows Main St. through Tortugas, goes under I-10, curves north along Espina Street to the frontage road. Formerly considered part of NM-342 spur. Previously --- Rincon. Possible extension back to U.S. 85 in the 1960s before construction of I-25. History: Established c. 1950, may have gone back to U.S. 85 at some point. 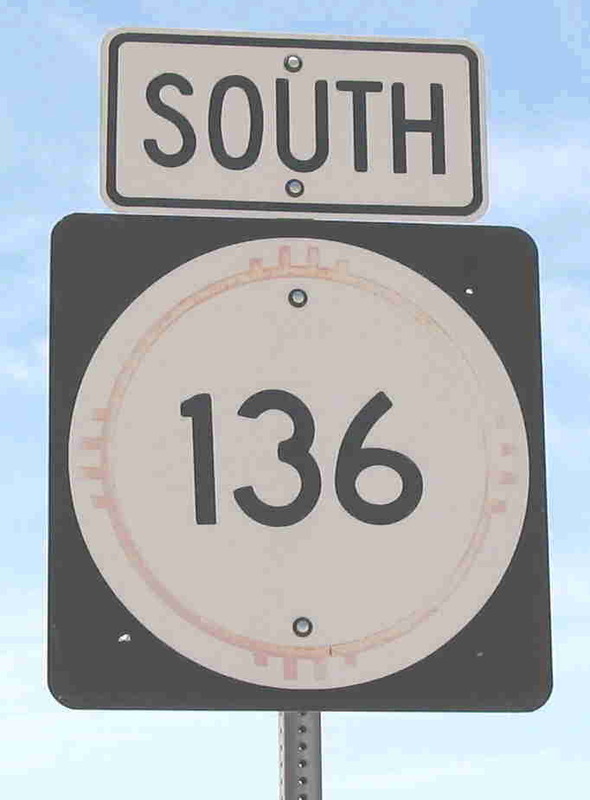 In 1988, the connection from Rincon to Hatch became NM-154, and this route number was applied to the road from Rincon south to NM-185. History: Not sure of the history of this route, possibly created c. 1988. Removed from state highway system by 2003, now Luna County B026. Comments: Ended at an intersection where each leg had a different route number. The two other legs were consolidated into NM-143, the only surviving route to Rockhound State Park. History: Created in the late 1930s. Shortened probably in the 1980s. Photo taken at junction with Luna County B026 (former NM-141). History: Created 1988 as part of a highway transfer agreement with Luna County. Apparently ended at a three-way terminus with NM-141 and NM-497. When 141 was removed from state system after 2000, this route and 497 were merged into a single route. History: Would probably pre-date 1988, since new routes in this area would be NM-5xx. Comments: Only exists to serve the school. History: Created in the mid 1930s. Shortly thereafter, combined with other routes to form the extension of NM-78 which existed until 1988. Now called NM-163. Comments: One of several routes in the northern part of the Black Range that were created in the 1930s and then redesignated within a few years. Only shows on a 1936 map. History: Established 1940s as part of NM-81. This segment, due to short concurrency with NM-9, was redesignated as NM-146 in 1988. History: Established 1980s (?) as link between old U.S. 85 and NM-47 at Isleta Pueblo. 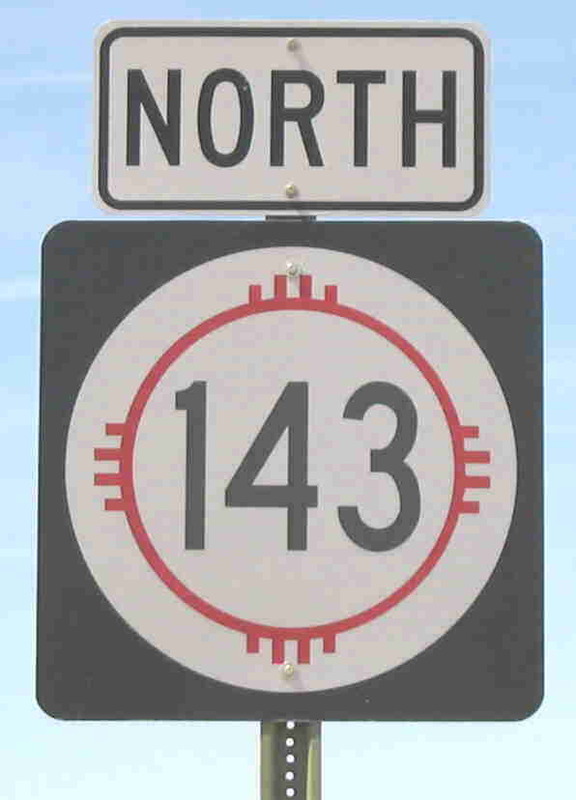 Comments: Coincidence, or is this a rare instance (for New Mexico) of a three-digit state route number based on one of its intersecting routes (47 --> 147)? History: Beginning and ending not known with certainty, and its existence is only indicated by its being shown on on-line maps. From its number, it probably would have been established in 1988. Most likely removed after a few years. Comments: This would have followed Solana Road west of NM-497, which presently or formerly came south from Deming parallel to and west of NM-11 before turning east on Solana Road. It may currently be Luna County Road C-57. This route is shown ambiguously on Mapquest along the same route as the indicated county designation. NM-331, its western terminus, I believe has been removed from the state highway system. History: Established c. 1960, may have been T route with one leg going to NM-3 (present-day NM-522) at Arroyo Hondo. Appears to have been routed onto a new road that intersects 522 and U.S. 64 at their junction. Comments: Passes through the artist colony of Arroyo Seco. North of there, after the north junction with NM-230, runs up the Rio Hondo canyon to the Taos Ski Valley.